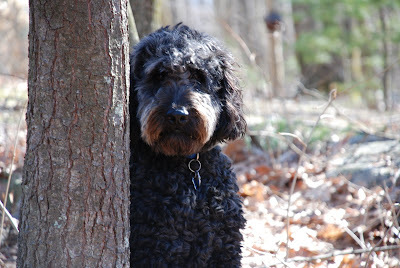 Hi my name is Stephen I am an almost 3yr old GoldenDoodle. That is a cross between a poodle and a golden retriever. I am super smart and I don’t shed what more could you ask for? Maybe a less lame sounding name I am thinking Velocadog would be kind of cool. At this point I am sure you are thinking why are we getting mail from a dog? We make memory devices what is it a dog a dog want with us? It is not like we make tennis balls or sausages. Well here is the thing. My A and R, those are the people that feed, me they are very nice, recently got a new camera. They take a ton of pictures of me I am pretty photogenic. Check out the enclosed photo if you don’t believe me I even signed it. Well my A bought one of your Extreme III 8GB memory cards you know the ones with the mail in rebate. On the surface this is an awesome deal. So my A cuts out the original UPC code, fills out the form and sends it in. Sweet we are all set rebate coming in 4-6 weeks. Well unfortunately we got a card in the mail yesterday saying our rebate submission was missing the original UPC code. Now I know the whole idea behind rebates is that you expect 80% or more of people to be too lazy to fill out the forms and send them in. That is fine I have no problem with you taking advantage of the lazy or stupid outer there. Believe me there are lot of those people. At least you are not trying to patent the stupidity of the American public like Bank of America. Business is Business and I can understand that. My problem is that we sent in the UPC code, I know because we still have the box with a hole cut in it where the UPC code was. Since we had to mail the original and you say you never got it we are kind of at a stand still. I have tried to call the number listed 1-888-701-7637 to discuss this with someone but no one answers. So what am I to do? I would like the rebate check but I can not produce an original UPC code because it was in the envelope I sent to you. Maybe when you opened the envelope you lost the UPC code. I don’t know and I don’t want to blame anyone we dogs are not about blame but I know I sent it. I doubt this was intentional on your part because that would really evil like Walmart evil. Do you know part of Walmart’s business plan it to pay their employees so little that they are forced to shop at Walmart. Thus Walmart is effectively paying its employees in goods. I am sure SanDisk is not evil in fact you guys make a really great product which I highly recommend. At this point I have feel that I am owed the rebate which I believe is $40. I am sending you this letter and will continue to try and contact your people to get this resolved. I pledge to keep calling until I get this resolved. The way I figure it I am home all day and I have access to a phone so I have no reason not to call and be put on hold. You have an 800 number. How much does that 800 number cost you per min? Let’s be conservative and figure it at $.02/min that means if I am only hold for 33.3 hours it costs you $40. I figure since my A and R go to work for 8 hours a day I can be on hold for 8 hours a day which would cost you $9.60 per day at my conservative $.02 per min. I pledge to continue to call and sit on hold until someone talks to me or I get the rebate. Remember I am a dog and I have free time. I also have excellent hearing so I can put you on hold and as long as I am in my yard I can still hear the hold music. “da da dum deed de dad a de ad” The music is pretty soothing a little repetitive but I could definitely take naps to it. If you could include and autographed picture along with my rebate check that would be great. If not no big deal I will be happy to stop calling once the rebate check comes in. Hope to hear from you soon I am off to make a call. I think you are gonna make out better with the hold music. I hope that they have the girl from iponema. But seriously, I put in two rebates through Office Depot and they still have not come in, they were for $200 for my mom's new computer. Most rebates that I send in, I get back quickly.